Rewind now, ohhh 13 years. There is turbulence in my home. A lot is going on that I don’t understand, but I know that my parents are at odds. A lot of things transpired but that’s not what this story is about. What matters is this: so many people dismiss the problems of a child as insignificant. I was struggling with a lot, because I hadn’t altogether developed coping skills yet. I was an angry tween. Most just concluded I was just acting out. The Internet became my retreat. No one judged me or dismissed me there. I had real friends online, even if I had never met them face-to-face. I frequented several chat rooms as well as online games. These were my safe places. In one such chat room, I met a Dragon. He was always kind to me, and listened to my stressors. He never dismissed my issues as insignificant. He was never rude or untoward, and I naturally clung to him for dear life. The highlight of my days was coming home from school to see if he was online. Eventually, once we moved into the time of cable internet, he would leave his webcam on even if he was at work, so that I could look at his fish tank while I did my home work. I had pictures of my Dragon in my locker in school. I was beyond infatuated with him, all because he was kind to me, patient with me. He was a dose of stability in an otherwise tumultuous existence. He had helped me cope with the most trying events in my life to date and that’s what I remember most when I think about those times and about him. As time passed, we both got older of course and life happened. He moved to the city and I was a teenage girl, making my own fair share of mistakes and learning life lessons. I had assumed that he had settled down and had moved on with his life. I held no hard feelings. In my mind, he had given me the gift of my life. There was no tainting that. I went through my fair share of long-term relationships. I skipped the dating game and just committed to each as they came along, then cut and run when the nose dive became inevitable. In March of 2011, I broke off the last of those doomed relationships. It was at that point that I realized I had spent virtually my entire post-puberty life as part of a pair and didn’t really know how to function as just me. So I plunged into the dating game, determined to learn how to not only exist, but also to function & thrive as a single, solitary unit. I spent some time with a friend I had met on WoW near Houston, TX. We were absolutely not at the same place in our lives though, so it would never be meant to be. Following that, I dated locally in the Ottawa area and met all kinds of interesting people. I was learning how to socialize. It was an invaluable period in my life. Skip forward to February 2012. I recall that my father, sister & I were cruising around working on a photography school assignment for my niece. It was lots of fun! I was driving, so I didn’t pay a whole lot of mind to the Facebook notification I had received from someone by the same name as one of my bosses at work. It wasn’t until much later that evening, seated at my desk at work, that I actually looked into my updates. I pulled up the profile, wondering why the boss man had created a duplicate profile, when it hit me. The location of this 2nd profile matched that of my Dragon. I was somewhere between shocked and elated. It had been years (a good 7 or 8) since I’d heard from him. I was awestruck; dumbfounded. I added him and we got to talking. We discussed what had happened in the time since we had last been in touch. Turns out my theories had only been half right. He’d moved to the city and had settled somewhat with a girl, but the vast majority of those years had been spent in incarceration. He had gotten into some legal trouble over drugs. I was sad to hear it, and honestly a bit surprised since he had protected me from the darker side of his life the whole time I had known him. It didn’t take long for me to decide I needed to visit him. I wanted to be supportive of him as he readjusted to life in the free world as he had been so supportive of me through the trials & tribulations of my youth. I bought a plane ticket and flew into DFW in the third week of March. The time between making the decision and the actual trip seemed to crawl. But finally it had arrived!! I was an anxious ball of nerves for sure. I knew already how I had felt about him before, but had no expectations. I was making the trip as a friend and would not place undue pressure on him. That was not what he needed, after all. He met me at the airport. If memory serves, I was wearing purple. He was wearing red & blue jeans. I was so shy but giddy as I could be. After going through the motions & collecting my bags, I headed out the prearranged door. He was leaning right up against the railing just outside the door, so still and quiet that I walked right past him. He texted me and told me to turn around. I do & he’s shaking his head, laughing in a good natured manner. We are both a little shy but it isn’t an uncomfortable silence. He takes my luggage and leads the way to the car, where grandmother is waiting. It was an hour or more drive back to the house. My Dragon & I sat in the back seat, chattering a little and… Holding hands. I felt like a grade school girl all over. I had dreamed of this all through my youth and finally, here I was with the man who, in his youth, had been a pillar of strength and kindness to a wayward little girl. It is my firm belief that I would have turned out much differently had it not been for him. I had made an opportunity to begin to repay the kindness that had been so pivotal in my life. I felt (and still feel) that I would never be able to repay it in full. How do you properly compensate someone who has granted you your life? I spent 12 days there. They were amazing. We talked a lot, and after some time, we loved a lot too. We just seemed to synchronize with one another. It was surreal how well we just… Clicked. I felt like he not only belonged in my life, but like he had always been there. I felt a sense of calm and ease that I had never before experienced. Those who know me understand how anxious I am, how prone to worry I am and just general high strung I am. It was like he stunted all of that. Like he muted or muffled it. His very presence created a sense of calm and general contentment the likes of which I had never known. I was acutely aware before much time passed that the feelings I’d had for him in my youth were not only still there, but were so much stronger following the life experiences between now and then. I told him of my desire to move back south, to spend some quality time with this side of my family before I missed everything. My nieces & nephew, all of my father’s side of the family and of course my big sister, were all down here and I wanted life with them. I also (seemingly jokingly) informed him that, should I manage to make my way down here, that he’d best watch out, as I would most certainly chase him. He was laying on the bed on his back, hands laced together behind his head, when I shared this last bit of info with him. I was sitting cross-legged on his right side, next to his hip. He made a dramatic show of considering it for a log moment, grinned, and so informed me that he just *might* let me. I giggled, thanked him for his benevolence & leaned over to kiss him. During my stay, I met most of his family and we spent some time on the family farm as well as helped paint his mother’s new home. Relatively normal affairs, and not particularly eventful, but it was good. It was true and it wad comfortable. Towards the end of my trip, I attended the orientation for his federal probation with him. I became as well versed in the conditions of his freedom as he was. I remember when he had asked his PO (who, by the way, ran a background check on me prior to allowing me to visit) if I could attend, the man told him that it was really intended for someone a little more permanently affixed in the life of the parolee. My Dragon smiled and told him he hold I would be. Like all good things, the end came too soon. April 2nd was the date of my return flight. Grandmother took us for lunch at The Cotton Patch. 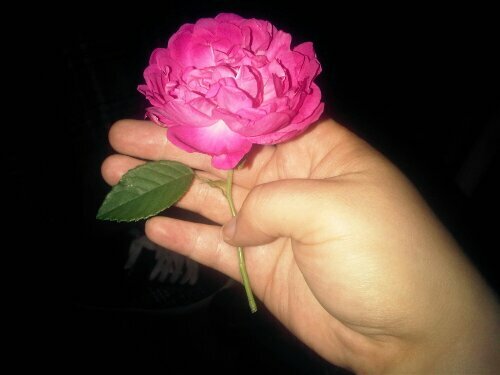 On our way out for lunch, Jeff clipped a perfect wild rose out of the garden & gave it to me. Such a simple thing, and yet it was everything. I wore it behind my ear all day, until we arrived at the airport. He unloaded my luggage for me, and I bawled. I felt like I had only just got him back in my life. Leaving felt so unjust, so cruel. After I arrived back home, I virtually had a phone glued to my ear. If we were both awake, we were on the phone. Period. He observed in that first week apart how profoundly silent it was without me there. I truly believe he missed me every bit as much as I missed him. One day, during one of my morning rituals following a shift, I was cooking breakfast. My sister was working on homework and my Dragon, of course, was whispering in my ear. I don’t readily recall the topic of conversation, but it was light hearted. Context be damned, my Dragon told me “Well he may not know much, but he knows he sure loves you.” I paused, my jaw dropped & I swallowed the urge to giggle like a school girl. He was silent, like he had surprised himself as well. I asked him, in as level a voice as possible, to repeat himself. He refused of course, acting all embarrassed. I finally took mercy on him & shared the sentiment. I knew full well I had loved him since before I knew what love was. To hear him say the words to me… Oh, I was soaring so high with no descent in sight. I knew then that I had to get back to him. The following few weeks were filled to the brim with overtime. I worked as much and as often as I could. The first week of May, I submitted my resignation notice. And of course, that brings us full circle back to May 15th, the day my whole life would change and the very purpose for my existence came within reach. I knew love, and nothing would ever keep him from me again. Or so I had believed, with every fiber of my being. I was wrong. I was so, so wrong. There is no other comparison that can really do the last several trips around the moon in my life justice: were I not living it my own self, I would hardly believe it either. And to think, it has only been a year! My resignation notice is officially effective. I am unemployed now for the first time in years. It’s a strange, surreal feeling, but not quite as scary as I’d have thought, since I had a plan. I’m always okay with a definitive plan of action. Around 5pm (CST now,) I finally stop. I’ve been driving for a while now and I’m tired. I get a room at an Econolodge somewhere in south Indiana. I chat with the boy a while and then hop off to lay down. I sleep until shortly after 1 am. I get up, shower and get back on the road and drive. I try to call the boy but he must be asleep so I crank the tunes and cruise. I observe as I’m making my way through Missouri how dang bumpy it is. Up and down. This is where I am when the sun rises and it’s beautiful. I am feeling a sense of calm determination. I feel like my life is my own and I am taking the proverbial bull by the horns. It is empowering. After a while, the boy calls me. He is groggy and not altogether awake. I laugh because I find it endearing. It takes me back 6 weeks, when I had visited to meet him & his family. I recalled waking up with him, before either of us were completely sure what this was between us. The memory of his sleepy eyes and content smile as he wraps his arms around me and pulls me close to wish me a good morning makes me want to drive faster. I’ve already been away from him for too long. I drive and drive and drive. The whole trip is relatively uneventful. I briefly pass through the northwest corner of Arkansas and into Oklahoma. It’s fairly late morning by the time I approach the Texas border. The excitement is almost like electricity in me – almost tangible through every nerve in my body. The further south I drive on I-75, the more familiar my surroundings become. It is all I can do to respect the speed limit at this point. Everything I need in my life is mere minutes away and I can’t stand to wait. I finally exit the highway and almost wail in despair at the red lights and stop signs through the neighborhood as I make my way along the path I traveled several times less than two months ago. Shortly after lunch on May 17th, 2012, I finally turn onto my street.. my new street, and there he is, standing in the front yard. He is wearing light blue stone wash jeans and a crisp white t-shirt. I see my future and I can only barely manage to get the car in park before I fly out the door and into his arms. I almost take him down. He laughs, and he kisses me and life is perfect. Even for a brief moment, I know perfection, when he lays me down in the shop and loves me.